We have a wide variety of finishes available, and this marvelous, handcrafted, Western style bed can be finished in a stain appropriate for your home décor. 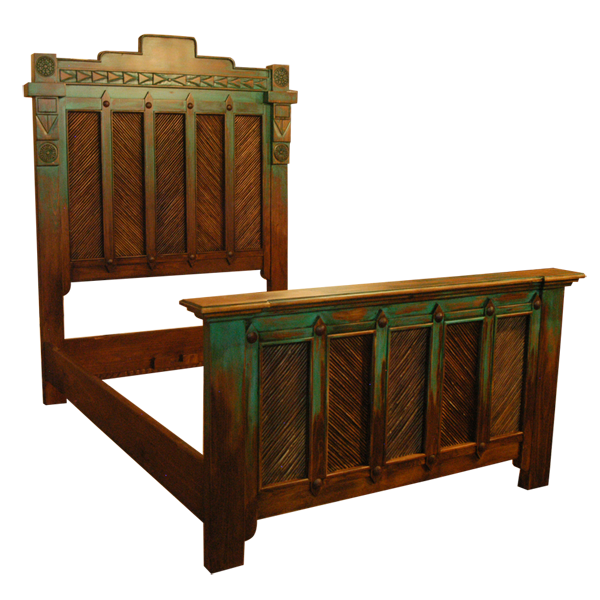 The bed has a solid wood, rectangular headboard, with a staggered, rectangular, top crest, and below the crest are hand carved, geometric designs. The front of the headboard has five, vertical, rectangular panels, and each panel is built with a diagonal, wooden rod design. The wood inside each panel has a natural finish. 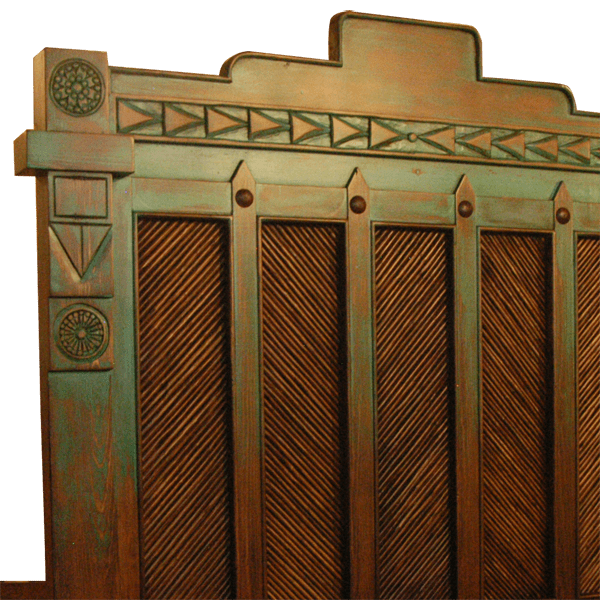 Each panel is divided by a solid wood upright, and the top and the bottom of each upright are highlighted with a hand hammered and hand tooled, copper concho. The headboard is framed with solid wood uprights, and each upright is accented with hand carved, floral designs and geometric details. 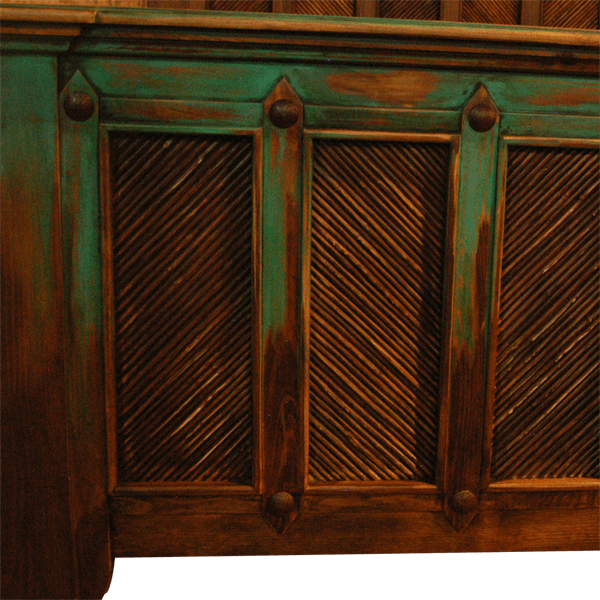 The footboard has a staggered, top, wood molding, and below the molding are five, vertical, rectangular, matching panels. Each panel is built with a diagonal, wooden rod design, and the wood inside each panel has a natural finish. Each panel is divided by a solid wood upright, and the top and bottom of each upright are garnished with a hand hammered and hand tooled, copper concho. The headboard is framed with solid wood uprights, and each upright is enhanced with hand carved, floral designs and geometric details. The bed has solid wood, side rails, and it rest on square cut legs. 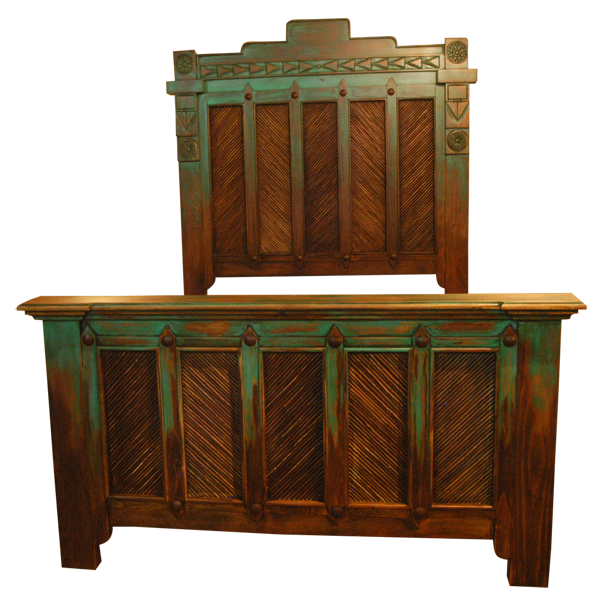 It has a distressed, antique finish, and it is made with the best, sustainable, solid wood available. It is 100% customizable.